The first step to organizing your new home is to sort through each and every box after your move. Getting rid of moving boxes and clutter will not only free up space in your new home, it will create a more functional and tidy environment and allow for the unpacking process to begin. Besides, your family will appreciate that you did! If you come across items that really didn’t belong in a space to begin with or were taking up precious real estate in your home, then start a “keep” and “toss” list. When going through this process of determining what stays and what goes, it helps to keep your organizing goals firmly in mind. So, let’s get started and let’s get creative! Use the inside of a cabinet door or under the cabinet to store spices rather than taking up an entire cabinet. 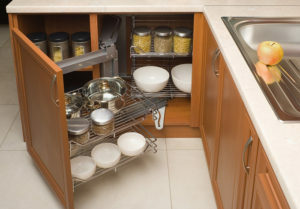 For deep cabinets, remove the shelving and install a free-standing drawer system. Keep overflow groceries and bulk items out of primary space; store on shelving in the basement or the garage. Window seats and banquettes can be dual-purposed for kitchen seating and storage of extra kitchen items. Use a bench with storage under the seat for kitchen linen storage like table cloths, napkins, place mats, etc. If storage space is limited, decide what the best use of the space would be. Should it be for cleaning items, food storage or cookware? Consider the location and ease of access before making a decision. Install wire baskets to make use of an otherwise narrow, unusable space. If the space is significant, create zones for separate categories and label appropriately. If the space allows, use this area for recycling containers, extra bags, paper products, etc. If you are short on storage space, create a pantry using an armoire or tall cabinet with doors. Make use of vertical space! Build shelving to the ceiling, or install two layers of rods to double your hanging space. Buy modular units to store shoes and sweaters on existing shelves. With closet space that is double deep, store large, lesser used items like luggage and containers with off-season shoes in the back. Or, install a second rod behind the first, to use for off season hanging storage. Install modular units to use as coat, shoe and accessory storage. Use a bench with storage under the seat for gloves, hats, scarves, etc. Use either side of door for shallow shelving or a tall narrow table to place items on when you enter/exit. Install hooks by the door to hang keys. Use multi level hooks for coats, backpacks, handbags, etc. at the appropriate height for all members of the household. Place family calendars in this area so that everyone can see it as they come and go. Use baskets for attractive solutions to contain small items like gloves, flashlights and dog toys. 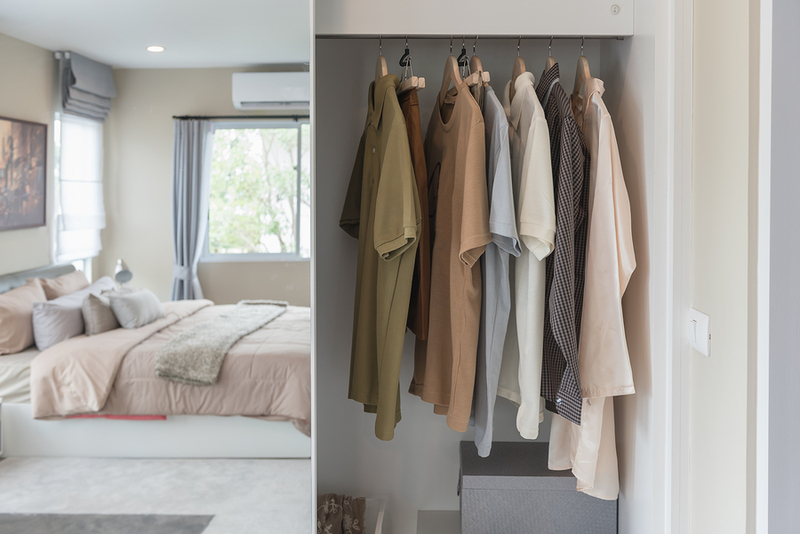 For older homes with limited hanging closet space, consider a piece of furniture for storage such as an armoire for overflow hanging or use as a linen closet just outside the washroom. Use vacuum storage bags for bulky items like comforters and blankets; store these items high on shelves and everyday use items at eye level and waist level. Store off-season linens like beach towels and bed linens in higher areas when not in use. With limited closet space, use an armoire or large chest for sweater storage. Use vertical space as much as possible. Install shelving high on walls even if it means getting a ladder for access once or twice a year. In houses with limited built-in storage space, each piece of furniture should serve multi-purposes – holding and storing. Purchase furniture that holds an item such as a TV, but also doubles as clothing storage. Use decorative boxes for storage of lose photos and small memorabilia within the room. Choose a pattern/color that you don’t mind having stacked neatly on the floor or on a shelf. TIP: To gain more storage throughout your new home, install wire shelving on the back of doors to store miscellaneous items. Need help getting unpacked and organized? Contact Organizing Boston today at 617-744-1429 or info@organizingboston.com!